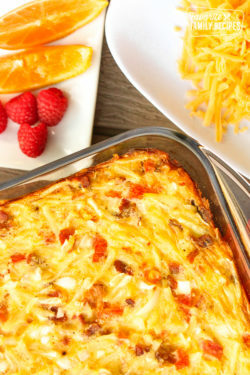 Breakfast Casserole is a show stopper when feeding a crowd. Light yet filling, easy yet beautiful, this is the perfect breakfast or brunch dish! chopped veggies We like to use broccoli & tomatoes. You can also do red peppers and onion if you want even more flavor. In a bowl, beat eggs and milk. Stir in all other ingredients. Put in greased 9x13 pan and bake at 350 for 45-55 min or until well set. Serve topped with salsa.